This week, I once again decided to take my cue from the dear old Great British Bake Off, making something that ties in with the week's theme. This time I went straight for the showstopper and made a filled loaf. And who better to go to for inspiration than the man, the legend, the silver fox - Paul Hollywood himself? 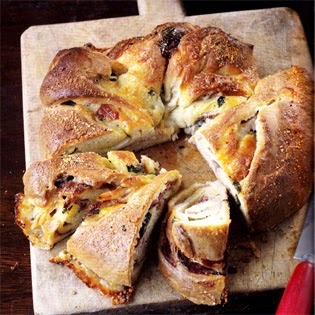 So I opened 'Bread', the book that I consider Paul's seminal work and stopped on the page entitled Savoury Brioche Couronne. But, this being me, I thought I knew better than Paul. For a start, I was going to leave the parma ham out, being pescetarian (don't start, just don't). And I'm sick of making brioche, so I decided to make a much simpler bread as the vessel for my filling. Then I looked at the picture of Paul's couronne and I said: "It's not very pretty, is it Paul?" I talk to Paul a lot. But only in my head, since he took out the restraining order. 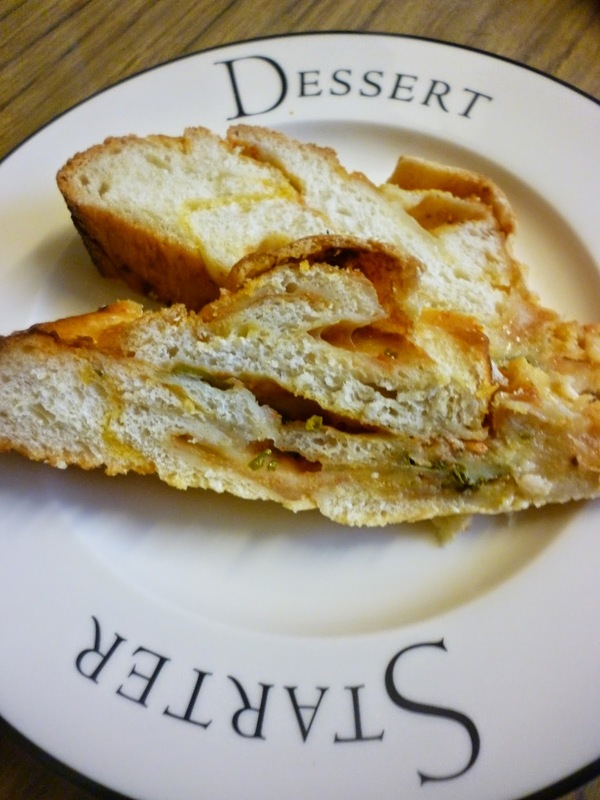 Said picture of the offending bread is found below - for your convenience. Anyway, the upshot of my imaginary conversation with Paul was that I decided to make a four-strand plaited loaf of a kind. But I still wanted the effect of the ingredients spilling out of the bread and I still wanted the visually pleasing effect of a wreath. Of course, plaiting four strands of bread which have fillings spilling out of them is a little harder than just twisting two strands together. SHUT UP, PAUL. IT IS PRETTY. IT IS. Without further ado, here is the recipe for my Plaited Tricolore Wreath. As you can see, this makes a pretty big loaf - it's covered a whole dinner plate here and is hanging off the edges. So it would probably make a pretty good centrepiece to a family lunch or casual dinner party. 1. Put the flour in a bowl and add the yeast and salt to opposite sides of the bowl. Mix in the olive oil and water (you may not need to use all of it) and knead in the bowl until it comes together into a soft dough. 2. Turn out on a well-floured work surface and knead for about 10 minutes until pliable and very very stretchy - you should be able to quite easily stretch this dough thin enough to see daylight through it without it breaking. Put in an oiled bowl and cover with clingfilm, then leave for 1-1½ hours until doubled in size. 3. Without knocking back, slice dough in half and put one half aside. Using a well-floured large work surface, roll out the other half into a large rectangle. Spread with sundried tomato pesto, but not quite to the edges, as this will make a mess later. Sprinkle over half the mozzarella and basil. 4. Wet your thumb and use it to tack down the nearest long edge so that it sticks to the work surface. Then, grasping the far edge of the dough and rolling towards you, roll the dough into a fat, tight sausage. Roll until the seam disappears as much as possible. 5. Repeat the process that begins at step 3 with the other half of the dough. Then slice both sausages down the middle lengthwise, exposing the filling. You should now have four strands. Take one end of a strand and stick it down to the work surface. Stick the same end of each of the other strands down on top of it. 6. Now comes the potentially messy bit. Number the strands 1-4 in your head. Take strand 1 and cross it over strand 3. Strand 1 has now become strand 3, strand 2 has become strand 1 and so on. Take strand 4 and cross it over strand 2. Repeat until all the strands are used up. 7. Still operating with the utmost care and delicacy (or, if you're me, mauling the bread all directions whilst making mewling noises of distress), take both ends of the bread and manoeuvre it into a circle, pressing the ends together. Lift it onto the greased and lined baking tray - you may need help. If you're using a silicone baking mat, like I was, it might help to slide that under the wreath and then lift the whole thing onto the baking tray. 8. Wrap the tray in clingfilm, or ideally, put the tray inside something like a bin bag, with plenty of room for the bread to prove. Put something in the middle of the wreath, to stop the hole closing as it proves. Don't, like me, make the mistake of using a ball of foil, because the melting mozzarella will find its way around it as it bakes and will stick to it. Leave for 1-1½ hours until doubled in size, preheating the oven to 200C sometime before the bread has finished proving. 9. Brush the wreath with the beaten egg, taking care not to let the egg run down too far and stick it to the baking tray - the cheese will do that for you. Bake for 30-45 minutes until the bread is risen, golden brown and makes a hollow noise when tapped. Also check for a soggy bottom. I'll be sure to add on a nice cross section when I cut into the bread later. And then hopefully my colleagues will help me polish it off at work tomorrow. Edit: Here, as promised, is a picture of the cross section of my bread. I like the marbling effect, the bread itself was soft but cooked through and there are none of the gaping holes caused by excess water that often plague filled loaves. Next week on GBBO, desserts! How exciting. I may be visiting a house-warming party on Saturday night so I daresay they'd appreciate me bringing a nice baked offering.